Not much to post today, for a number of reasons. We have left the United States and are now in the Sovereign Quileute Nation, and subject to their customs, that include not taking anything their grandchildren might want: no pictures of art works, no beach-combing. It's a foggy day, with the outline of A-Ka-Lat, the much-pictured sacred island just offshore, barely visible. I'm enjoying taking it all in, and not particularly motivated to reduce what I'm seeing to words. And, finally and perhaps most fundamentally, because there's no internet in our sweet cabin beside the beach. So to post something, I have to go sit in the wifi room at the office. 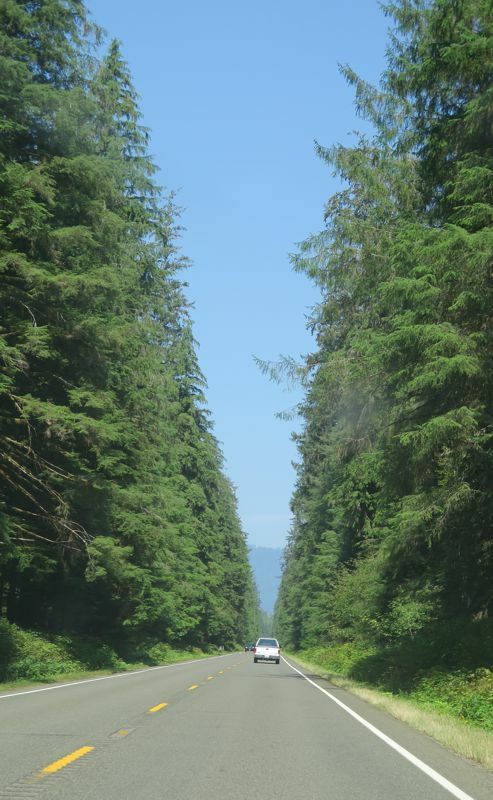 To get here, we crossed the long Astoria-Megler bridge and along the coast. Up here in the far yupper right-hand corner of the continental US, that's complicated by numerous rivers, estuaries, and bays, so 100 miles as the eagle flies took us 200 miles on the ground. Often we were traveling through long straight corridors of tall trees; other times, past the wreckage of a twice-harvested forest, the bare stumps and slash piles grey and lifeless. We travelled through Aberdeen, one of our least favorite towns, and had an elk burger at Kalaloch Lodge in the Ocean Unit of Olympic National Park. The internet at Quileute went down Sunday morning, and the staff had no interest in fixing it. A-Ka-Lat, called James Island by white-eyes like us, from the beach right in front of our comfortable cabin.